I think the picture is genuine but I think that the signature – although looking very authentic – is added, for two reasons. Firstly, Ansdell hardly ever gave his smaller paintings the full signature and secondly, it is signed “RA” – Ansdell didn’t become a Royal Academician until 1870 and in 1868 would have signed his paintings “ARA” – Associate of the Royal Academy. NOTES OF INTEREST What’s the difference between a Staghound and a Deerhound? Strictly speaking, a Staghound is a mixture of breeds based on the Foxhound breed used for hunting Red Deer. A Deerhound is a pure-bred sighthound BUT it’s not as easy as that as the Scots called a Deerhound a ‘Staghound’ as Scottish Deerhounds were also bred to hunt Deer. So this painting has a Scottish origin and is technically a Deerhound but is called a Staghound so the title is correct for this painting. This is a sensitive depiction of a hunting dog and its quarry – the sort of thing at which Ansdell excelled. From an early age Ansdell was invited to join the Earl of Sefton on his sporting trips. He acted as a sort of ‘artist in residence’ depicting the highlights of the trip for his rich patrons before the invention of photography. The nobility of the time liked to hang such reminders of their successes in the sporting arena on the walls of their large homes or Highland lodges. A painting such as this would also depict a favourite hound. This in itself would be a challenge for the artist in getting a good likeness: any slightly incorrect characteristic would be immediately spotted by the owner. 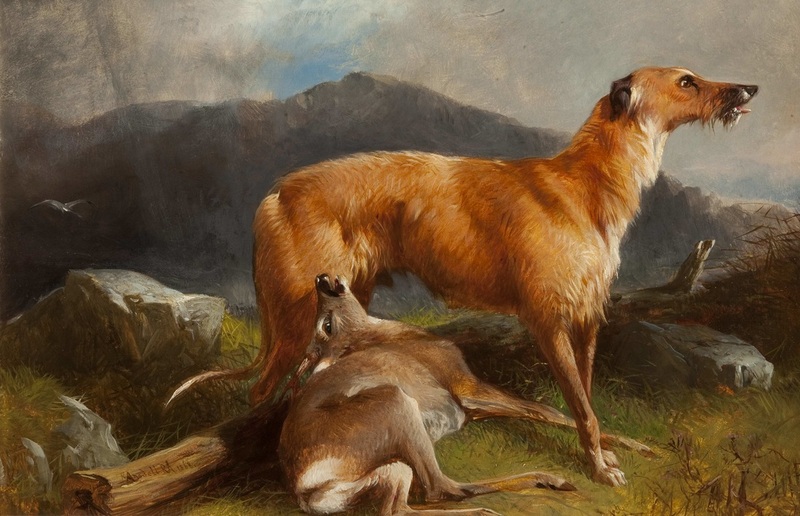 It is pictures like this one that helped put Ansdell on the map as one of the foremost painters of dogs in the field – the painting would be admired by the Earl of Sefton’s guests and many commissions followed for the young artist. I strongly suspect this painting is a small oil sketch which would have been utilised at a later date for a much larger canvas. This practice was common: the small paintings on board acting as an ‘aide memoire’ when a grand picture was later painted. The Victorians believed in 'big' and art was no exception! The manageable size of this painting, for me, is its huge attraction – at once engaging the viewer without being intimidating. The colours are soft and reflect the gentle misty atmosphere of a Scottish landscape. The subject matter may not be to most people’s taste these days but a close study of the deerhound illustrates well the prowess that Ansdell developed in animal painting – and especially in dogs. He treated his animals sensitively in a dignified way without the need for blood and gore which was so in fashion at the time. This is an understated dramatic moment if ever there was one – typical of the modest man that Ansdell was.